Are very intelligent, curious and have excellent memories, especially about food sources. Use their acute sense of smell for information about the world around them. Have good eyesight and color vision. Hear high pitches. Their hearing is excellent, though less relied upon than their sense of smell. Can run downhill and uphill at speeds exceeding 35 mph. When standing up, allows them to get more information from their senses of smell, sight and hearing. Bears have plenty of food to eat! Do Not Feed Bears! A fed bear is a dead bear! Bears are omnivores. Plant food such as berries, nuts and grasses along with larvae make up the majority of their diet (as much as 80%), fish and meat are important sources of protein and fat. Spring food sources include winter-killed elk and bison, elk calves, ants along with grasses, clover, dandelion and other plants. Summer food sources include thistle, fireweed, bistort. Roots and mushrooms are added to their diet as well as cutthroat trout, strawberries and, occasionally, other berries. Toward fall bears will feed on roots. Fall food sources include white bark pine nuts which are an especially important food source in the fall. Plants, berries and ants are also eaten. Elk injured or killed in rutting may also be a food source. 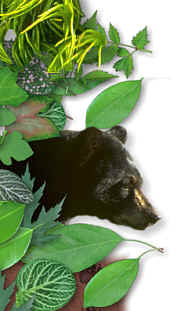 Bears hibernate because of a decreased food supply, not an inability to stay warm. Dens are used only during winter hibernation. Bears sleep outside, not in dens or caves, from spring through fall. Bears den from October or November to March or April. Males emerge from their dens first each season and females with cubs emerge last. Fat put on during fall is metabolized in the den—bears do not eat, drink, urinate or defecate for up to six months. Up to 40% of body weight is lost while denning. Heart rate drops from 40-50 beats/min. during summer sleep to 8-10 beats/min. in the den. Body temperature drops only a few degrees during denning. Bears can easily be aroused from their winter sleep. Dens are lined with leaves, spruce or fir boughs, or pine needles. Breeding season is mid-May to mid-July, with mating mainly occurring during June. Delayed implantation keeps fertilized eggs from beginning development until around the start of denning season. Cubs are born in January or February. Litter size is usually two, but ranges from one to four cubs. Play is important to cubs for social and physical development, and probably just plain fun! Sub-adult females tend to stay within their mother’s home range, while males usually leave their mother’s range.